DUG Insight User ManualFrequently Asked QuestionsFrequently Asked Questions VelocityHow do I create a velocity gradient volume? Follow the steps below to display the vertical gradient of a velocity volume at any point. Using the velocity gradient, large changes in the velocity can be easily seen. To be able to display the velocity gradient, a duplicate of the velocity volume is required. 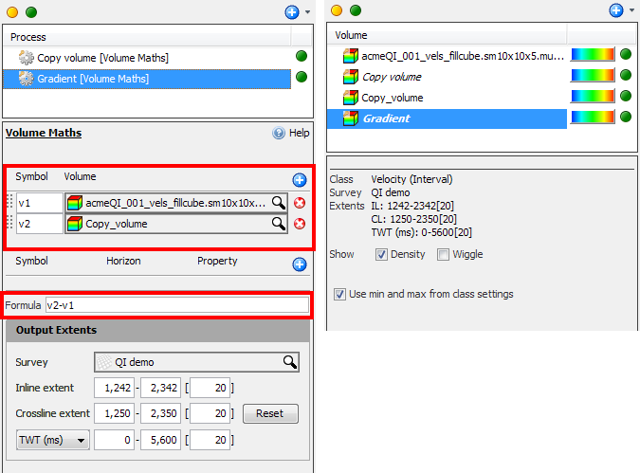 Follow the steps in Creating a Copy of a Volume to create a copy, export and configure the velocity volume. 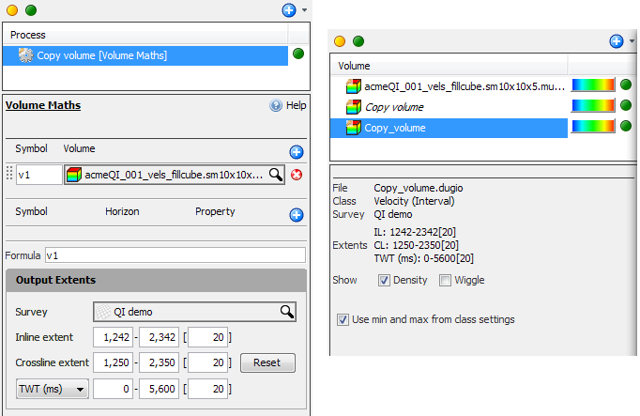 After creating a copy of the velocity volume, shift the duplicate volume by the desired value, e.g. -100 ms (see Manual Mistie Corrections). v1 = original velocity volume. As a result of this process, a new volume is available in the Volume tab based on the Formula. At the navigation bar, select the Gradient volume. The gradient can be displayed in 3D View, Map View, and any section views. Press F5 or F6 to make the colourbar hotter or colder respectively. Prev: How can I create a simple velocity model for 2D data? Next: How do I create a contact horizon for use in layered models?